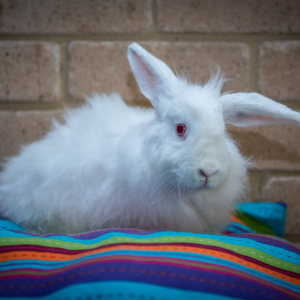 Huckleberry came into our care with Lucky who was an adoption return Domestic rabbit as owner could not longer keep. They are good buddies so we would like them to stay together as are well bonded and it is nice for them to have the company of each other. 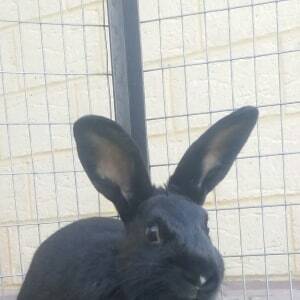 Huckleberry is a curious boy who likes to explore and loves his greens and carrot. He and Lucky would suit a home with a single person, couple or family with older children. They are located in Bullsbrook. 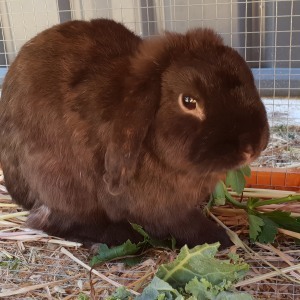 Merle is a very pretty smokey coloured rabbit with a soft coat. She is curious and likes to explore but also has quieter moments and likes to relax and groom herself. Merle would be best as single bun. She likes to spend some time outside to have a run around. June is a pretty little lady, who is looking for her perfect, bachelor-free home. She was matched up with a fun loving dude, but his unkempt hairdo just grated on her, so she now lives it up as a solo gal and loving it. You can win her over by presenting her with her favourite treats - kale and cranberries are highly rated, as is Italian parsley. She does love her alone time, but she is an absolute delight to watch when she gets chance to run on your lawns. She would be best suited to a more experienced bunny owner who is happy to let her come to them on her terms. Once she is in your arms though, she is happy to sit for a cuddle and is very easy to handle. Ready to let this lovely lady capture your heart? 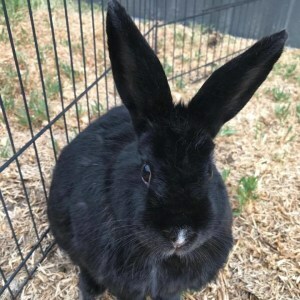 Hai Hai is a confident bunny who was found and came in with her friend Pete a Netherland Dwarf rabbit. They get on really well and are a bonded pair so need to be rehomed together. Hai Hai is curious and adventurous. They are best suited to a home with a single person, couple or family with older children as Hai Hai is more squirmy than Pete when being picked up. She is located in Bateman. 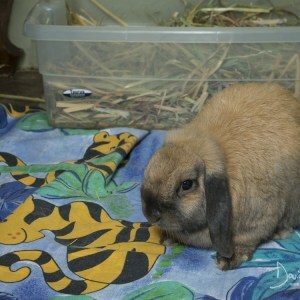 Lucky came into our care with his little friend Huckleberry a Dwarf Lop bunny. They are good buddies so we would like them to be adopted together as are good company for each other. 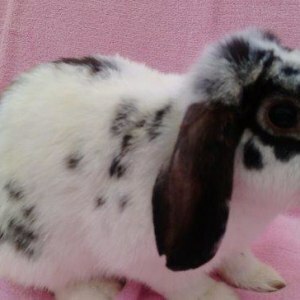 Lucky is a nice bunny with an interesting coloured coat. He has a damaged back leg as it had been broken years ago and set at a slightly odd angle. It doesn't stop him getting around at all, he just can't hop like other bunnies. Lucky enjoys his greens and carrot. They will suit a home with a single person, couple or family with older children. Lucky and Huckleberry are located in Bullsbrook. Sasha is a Cashmere x which means she requires regular brushing to keep her coat lovely and soft and knot free. She adore other bunnies and will snuggle with them all day long! 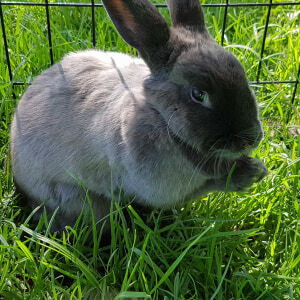 She definitely needs a home with another bunny and while she wouldn't mind being adopted with a friend of hers Bonnie (grey agouti coloured Domestic x bunny) she would also love to meet your bunny if you're looking for a special bun to bond them with! Sasha would suit a home where she can have an area of the house set-up as her own with all her toys, food and litter trays with free-range access time to the house and supervised outdoor time when the weather is nice! Because Sasha is a little on the reserved side she would suit a calm home with older children (13+), she has no issues with cats and calm (preferably older) dogs. For more information, please contact our foster carer direct on 0414 268 948. She is located in Bullsbrook. 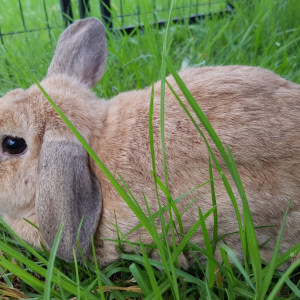 Dorothy is a laid back easily pleased rabbit. She is happy to explore your open spaces both inside and out. She loves to have a good dig in a sandpit, so an area where she can do this would be fantastic. She is not a cuddly lap bunny, but as she warms to you, she quite likes to have human company. Dorothy is not bothered by chickens or dogs, in fact she has made herself quite at home with the chickens and on the hot days can be found sharing a nice cool dirt bath in the shade with them. 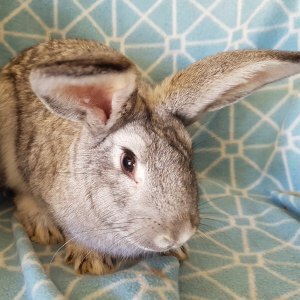 Duckie had a rough start to life and spent the first 10 weeks of his life kept in a small hutch in a shed with little to no human contact and only his brother Moose for company. When they first came into care they were very scared but since they have been with us they have moved forward with their new lives in leaps and bounds! They have become quite the independent bunnies who aren't afraid of anything! Their personalities shine bright and they will light up your life with their little quirks. Duckie is quite bonded to his brother Moose and they would suit a home where they can have an area of the house set-up as their own with all their toys, food and litter trays with free-range access time to the house and supervised outdoor time. Duckie is ok with cats, small/calm dogs and older children. 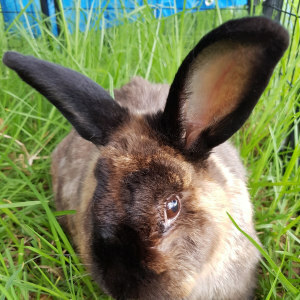 Meet Martin, a cute chocolate caramel floppy eared male rabbit, available for adoption. He enjoys a bit of freedom outside cage for few hrs in yard and loves his daily snack on fruit and vegetables, plus hay and rabbit meal and pellets. Martin would suit mostly anyone except very young children as he needs further daily handling to improve trust.